The University of New Mexico Alumni Association hosts a new event during Homecoming Week 2017. UNM's first-ever Diner en Rouge, an event where participants are asked to wear all red, in addition to packing a dinner to enjoy alfresco, is set for Friday, Sept. 29. All alumni, faculty, staff, students and community members are invited. Music, entertainment and other special surprises will be part of the evening taking place in the Karen Abraham Courtyard at Hodgin Hall Alumni Center. Tickets are $20 per person and can be purchased by visiting the Alumni website. Space is limited to 200 guests, so RSVPs are encouraged before tickets sell out. 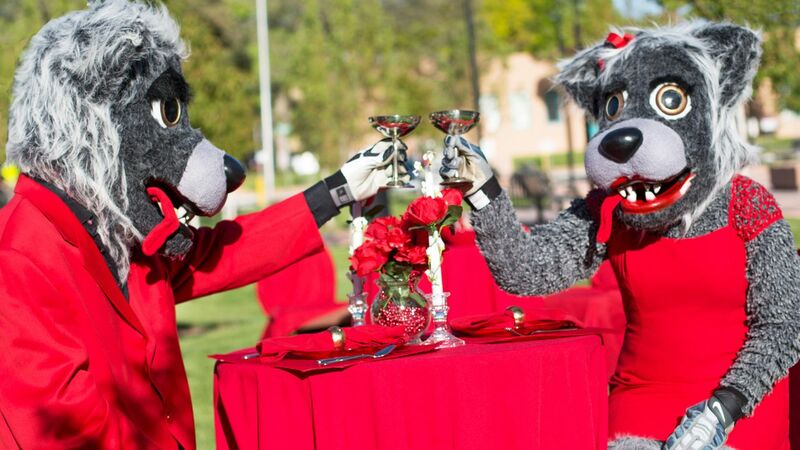 Diner en Rouge is an opportunity to reconvene with fellow Lobos; to reignite and rediscover the Lobo spirit during the Homecoming 2017 celebrations. The evening’s events will bring to life this year’s theme, Living la Vida Lobo—a celebration of each member of our Lobo pack. What to wear? Rouge. Come dressed in your fanciest, casual, or spirit gear, but make sure it is red. Best dressed prizes will be awarded. Visit the Diner en Rouge board on the UNM Alumni Pinterest page for ideas. What to eat? Gourmet picnicking or casual bites, whichever suites your style, just make sure to bring it in a red carryall, picnic bag or the official UNM Homecoming red tote available for purchase to embrace the theme. How to decorate your table? The Alumni Association will save you the trouble of hauling a perfectly sized table, chairs and linen. But, it’s up to you to bring items that will decorate your dining space uniquely. Prizes will be given for the best decorated tables. Have fun! The night includes special entertainment, music and more. Alcoholic beverages will be provided to guests 21 and older, with valid I.D. Other non-alcoholic drinks will be available as well. For questions and more information, call 505-277-5808 or visit the Alumni website. UNM Homecoming 2017 Living la Vida Lobo activities extend from Monday, Sept. 25 to Saturday, Sept. 30. With more than 50 events on the calendar during Homecoming Week 2017 there will be an event, lecture series, reunion, open house or tailgate opportunity to fit everyone’s interests. A full schedule of events can be found by visiting the Alumni Association’s Homecoming 2017 webpage.